Located at the heart of the CSULA college campus, this project has helped to refocus an academic environment that includes many architectural styles. The Golden Eagle serves as a gathering place for students and faculty. Its vibrant colors bring visual excitement to the campus, and its innovative form acts as a campus icon. The building is sited at the main intersection of pedestrian traffic on campus. The strong shape of the plan directs pedestrians into a central promenade where campus services are located, including the main dining hall and bookstore. Classroom space and additional bookstore areas are located on the second level. The third level houses a high-tech conference center and the executive offices of the University’s Auxiliary Services. The Golden Eagle separates food service and retail functions into two distinct operational areas, which are connected above the main pedestrian level by a system of sky bridges. These aerial walkways are covered by a lightweight canopy, which provides shade during the day and luminosity in the evening. The canopy also creates outdoor circulation areas and gathering spaces, effectively extending the building’s usable area without increasing square footage. The Golden Eagle was completed on-time and within budget. 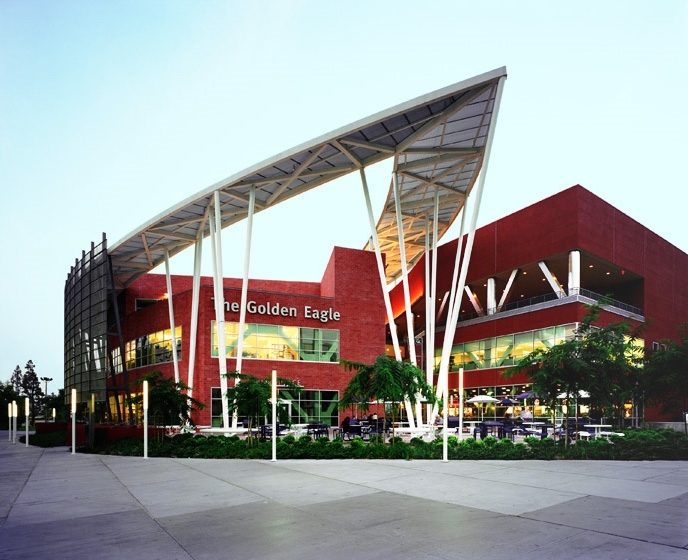 As a focal point for student activity, the Golden Eagle serves as a catalyst for the revitalization of campus life at CSULA.